Simulation speed is a key issue in many modelling software applications. Speed improvements give you the possibility to use more refined models, or to undertake more model runs within a viable timeframe. At DHI, we are aware of this and have developed different types of performance improvements for many years. We have introduced parallelisation in many of our products, particularly in those that most often have long simulation times. Parallelisation permits you to split the simulation work on several processors and thus obtain shorter simulation times. Solutions are developed for Windows PCs and for cluster computers and can also support the use of Graphical Processing Units (GPUs). The computational engines of our MIKE 21 and MIKE 3 software are available in two parallelised version – one with shared memory (OpenMP) and one with distributed memory architecture (MPI). 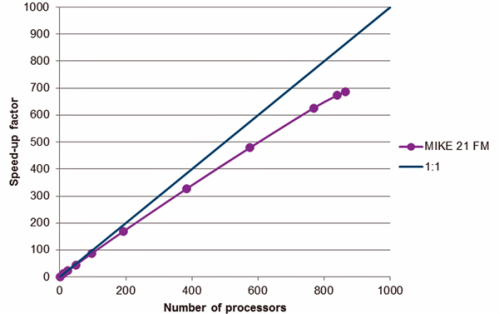 The parallelised versions result in much faster simulations with many cores. You can run your simulations with MIKE 21 and MIKE 3 on a high performance computer (HPC), which means that you can speed up your simulations significantly. Depending on your model setup, the speed-up can be close to linear - meaning that simulations run close to 500 times faster on 600 cores than the same simulations run on a single core. Contact us for more information about performance improvements.